yay! thank you so much for all the book love, wow! Just a little bit about Small Stash Sewing: The projects I've created are a way to use your precious designer fat quarters, without being a fat-quarter-only book, if you know what I mean! The idea was: oooh how can I feature this little morsel of fabric that I love so much? So, yes...I have made up 24 projects that feature fat quarters... and sometimes something else! You know me, I'm not one to stick rigidly to a prescribed format! So, some projects use more than one fat quarter (or less than one! 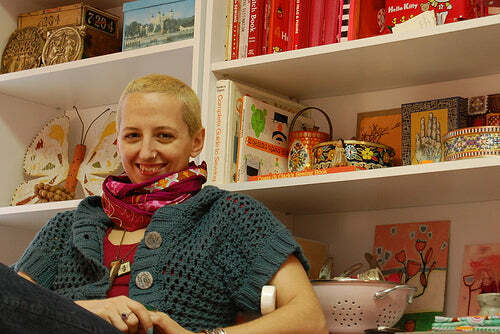 ), some use different kinds of fabric in addition to the cotton quilting fabric. Let's be honest, if you are hoarding fat quarters, you probably have some muslin hanging around or maybe a yard or two of a print you got supercheap, that sort of thing. I have been so excited to finally share the book cover with you I am thrilled by your enthusiastic response. 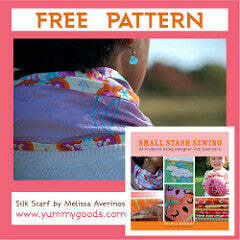 In thanks, I present to you a free pattern from Small Stash Sewing, the scarf from the cover! And just in time for some last minute holiday crafting! I'm psyched that this project is the one I get to share because it totally exemplifies my style: both my personal sense of style and the way I like to sew. 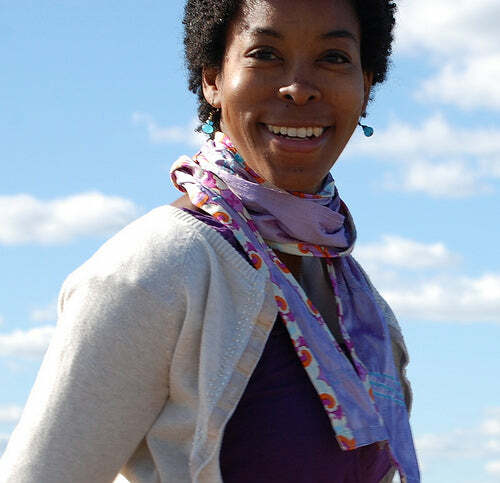 Remember when I went to Quilt Market last fall and I made myself this scarf to wear? This is a quick project, so I hope you'll take the time to make some of these for gifts and post your pics to the Small Stash Sewing flickr pool! Also? Isn't my friend Shelly gorgeous? I am a little nervous... did you know that this is the first time I have offered a pattern/tutorial? 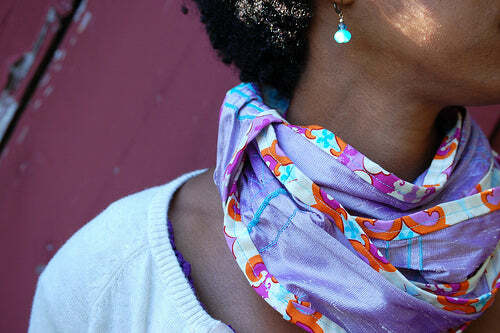 Ok, click the picture to download the free Silk Scarf pattern from Small Stash Sewing! In the file supplies list it states 1/8 yard of silk, but you really need 1/4 yard! Note: I used dupioni silk (will add to the pattern in the final edit!) , but if you don't feel like going out to get some, try fleece for a more cozy number or maybe linen if you have some laying around! Let me know how it works.